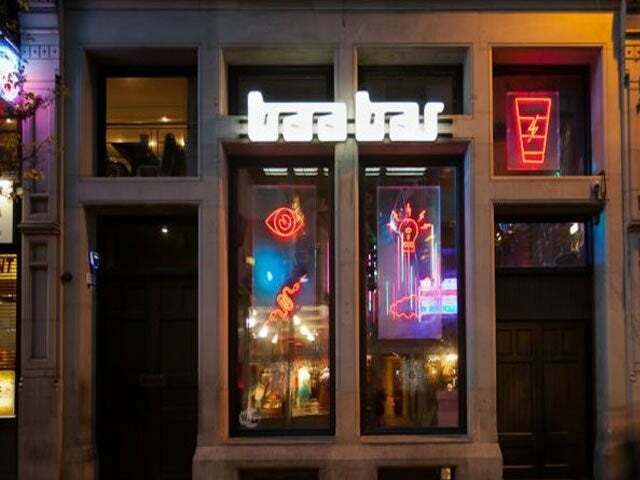 One of the best spots to sip cocktails, tip back shooters, or share pitchers with old or new friends in Nottingham, Baa Bar always serves up a good time. In the heart of Nottingham’s happening Hockley area, Baa Bar brings to the table a festive combination of creative cocktails and good times that have made it one of the places to go out in the city. You are surrounded by a hip vibe from the moment you walk in Baa Bar, as the decor is modern yet ultra fun with neon light tubes dangling from the ceiling and a large bar backed by the neon buzz of letters declaring “drink me” beside artsy hologram-esque wall prints. Yes, the venue is cool with a capital C, and their cocktails follow suit, featuring a newly formulated ‘science menu’ that blends ingredients together and presents them in a ‘chemistry class meets cocktail hour’ kind of way. A few of these experimental cocktails are the Candy Flux – raspberry vodka, French raspberry liqueur, lemon juice, and cream soda served in a glass beaker – the Chili Berry Sour – chili-infused vodka, strawberry puree, lemon juice, and cream soda served in a glass beaker – and the Rocket Fuel – gin, vodka, melon & citrus liqueur, and passionfruit juice – served in a smoking test tube. In addition to this special menu, Baa Bar prides itself on sharing pitchers, shooters, and a full line of classic cocktails as well. Baa Bar always provides free entry, and the drink specials on Tuesdays and Thursday nights are legendary in the city. It is also worth noting, that the venue is home to large reservable snugs, perfect for groups.